Radio and Weasel are the latest beneficiaries of Bryan White's free money and their's was in dollars...The Tycoon gave them $2,800. "Ugandans, I'm not bragging, I help fellow youth, these guys have done a great job in the last ten years, kept together for that long and yet they are not related is the reason I appreciate them." Bryan said. The duo were at the time rehearsing for their show that will be held later tonight. The excitement was too much that in their Potential song, they included Bryan White as having potential, so during the show if you notice someone's name being mentioned none stop as having potential, don't say we didn't warn you. It should be recalled that this show was bought by promoter Balaam, who long paid the artists off, so proceeds from the show go directly to the promoter. Weasel was quick to remind Balaam that he was not part of the 2,800 Bryan had just given them. 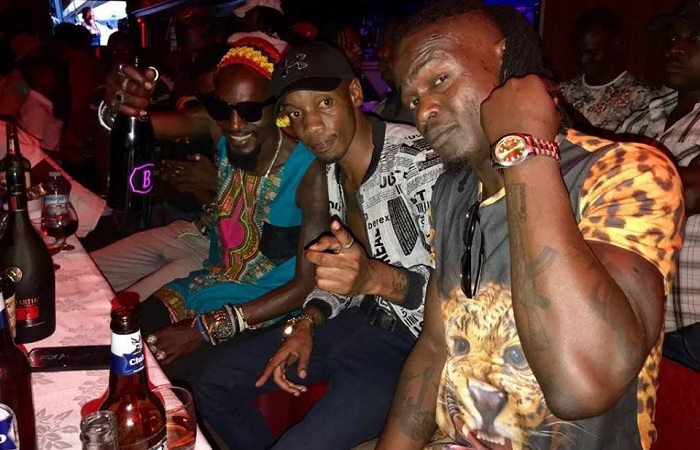 The excited Radio and Weasel went on to do the Potential song for Bryan White, who was dancing along with a pack of dollars peeping from his pocket. At the end of the performance, Bryan White said that Pallaso who was in the vicinity should get something, he was given 3million shillings. He then went on to warn those who show off on social media with rides that if they are not prepared, it's going to be very bad news for them because he is still splashing more dimes. The excited Pallaso gave out some five 20k notes to some fans who were earlier yelling to Bryan White claiming that they are also youths who should also be considered. This is certainly a game changer because even the late Ivan Semwanga used to give out cash, but not the way Bryan is doing it.